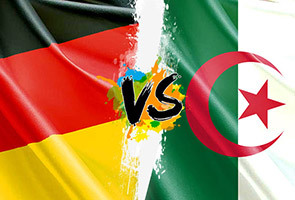 Algeria will hope to dish it out to Germany in their World Cup Round of 16 match. PARIS: The Riviera city of Nice banned the display of foreign flags Monday as French authorities tightened security ahead of a World Cup match between Germany and Algeria following riots after the last two Algerian fixtures. Christian Estrosi, the right-wing mayor of Nice, issued a decree temporarily banning what he termed the "ostentatious display of foreign flags" in the centre of the Riviera city, which is home to many people of Algerian heritage. "Since the start of the World Cup we have sadly seen intolerable behaviour that severely disrupts public peace," Estrosi added. He said the ban would remain in force until the end of the tournament. Some celebrations of Algeria's historic qualification for the second round of the World Cup spilled over into violence on Thursday with more than 70 people arrested for rioting or looting across France. That was more than double the 30-odd arrested on June 22 after Algeria's win over South Korea. The incidents prompted far-right leader Marine Le Pen to call for dual nationality to be revoked on the ground that the fervent support for Algeria reflected a failure to integrate into French society. Algerians make up France's largest immigrant group, with close to two million people able to trace their roots back to the former colony. Many hold dual citizenship and attachment to Algeria appears as strong amongst the French-born younger generation as it is amongst older immigrants. "We are asking everyone to stay calm while celebrating a victory," government minister Harlem Desir said Monday. "We must not let unruliness spoil what should be a party," he told the LCI television channel, adding that adequate security measures had been put in place to pre-empt a repetition of last week's incidents. Desir slammed Le Pen's comments as an "attempt to play one off against the other," and said the trouble-makers were a minority and not representative of the community. "I would like to see that we do not mix up little groups and the majority who conduct themselves in a peaceful manner," he said. Authorities said they would deploy hundreds of extra police in Paris, Lyon, Lille and several other cities ahead of Monday's match. Germany lost their two previous matches against Algeria -- 2-1 at the 1982 World Cup and 2-0 in a 1964 friendly. The winner of Monday's game will play France or Nigeria in the quarter-finals in Rio de Janeiro on Friday. Lyon and Marseille both witnessed violence after Algerian World Cup games. Algerian fans also took over a part of Paris's emblematic Champs-Elysees avenue and briefly clashed with police. Le Pen, the head of France's anti-immigration National Front party, on Sunday said the recent unrest was a good reason to review immigration policies. "Now we must put a stop to dual nationality," she told a talkshow broadcast on French television and radio. "There is not another country in the world that would accept what we go through on our territory," she said. Le Pen led her party to first place in May European elections with 25 percent of the vote in France and the National Front also did better than expected in local polls in March. French group SOS Racisme said it was "as dangerous as it is concerning" for Le Pen to use isolated incidents to support the National Front's agenda. Prime Minister Manuel Valls blamed "ill-intentioned individuals for spoiling a beautiful celebration" with acts of violence.